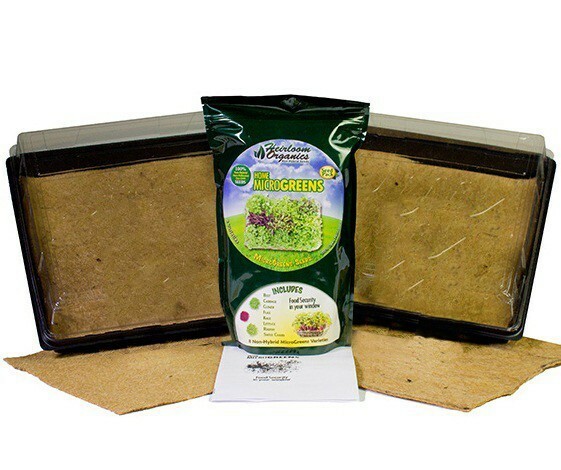 Complete Home MicroGreens Kit, including seeds, growing medium and trays. All you need to have a home microfarm in your window or outside. MicroGreens are the most nutrient-dense vegetables you can grow and they are ready in less than 2 weeks!! Grow them inside or outside, any time of year and have a ready supply of highly nutritious greens for your family. Over 1/2LB of seeds. Over 50,000 seeds. These Grow Mats are made from a natural organic fiber mat made without use of toxic binders or chemical additives. They are thin (1/8 inch) 10"x10" pads. The Jiffy Plant Tray is a versatile solution for healthy seedlings. This 10in x 10in tray is reusable, watertight and can be used with our organic Grow Mats. Made from recyclable plastic, this earth friendly plant tray comes with a clear dome to maintain greenhouse humidity and temperature for healthy seedlings and MicroGreens. Grow Mats / 24 pk. 10" x 10" Tray w/ clear lid - 5 pk.